I have just received the April newsletter from the Visual Commentary on Scripture. David Jones and Titian on Noli Me Tangere! There’s feast enough, but the third artist for this story is Fra Angelico! (see Matthew 28;12-15). Go to thevcs.org/ and you should find your way! 27 March: Before the Cross XIII: Peace or Power? Here, Jesus is flanked by Mary, his mother, and John the “beloved disciple”, in a moment that could not be more serene. Mary and John both have their eyes closed, and their hands positioned as if in prayer. The object of their devotion is obviously the crucified Jesus, who, raised above and between them, forms the focus of the carving. Adding to the peace and calm of the image are the leaves: trefoil forms (possibly alluding to the trinity of the Christian God), while the simple interlace designs at top and bottom call to mind those of Celtic art. I think the whole composition has something of a Celtic “feel” to it. Except, of course, that this is clearly an African work, and specifically one informed by the art and history of the kingdom of Benin, now a part of Nigeria. Osagie Osifo, himself from Benin, has fashioned this image deliberately to echo the famous bronzes, “rescued” by a British punitive expedition in 1897 mounted against the Oba (King of Benin) and his chiefs. The Oba ruled over a highly organised society which, though famed now for its art and advanced understanding of casting bronze, was also extremely warlike. It was a culture where much of the religion and ritual was focused upon the King himself and on his ancestors. Some of these customs have been restored and are practised today in modern Benin. Osifo’s carving of Jesus challenges this in the most radical way. The Oba stands between two of his officials in this bronze plaque. He holds a huge sword in one hand, and a staff of office on the other. The three figures are helmeted, the Oba appearing the most fearsome of all with his distinctive collar and his domineering stance. His helmet is spiked. Nothing in this image would signify peace or tranquillity; it has only to do with naked power and aggression. By substituting the Oba for Jesus, and the two warriors for Mary and John, Osifo has consciously declared his position: Christ is Lord. He alone is worthy of worship. Stylistically, Jesus and the Oba might share some characteristics: short legs and long arms, and both sport a similar wrapped garment with its hem rising to the waist at the front. (And there are leaf shapes on the Oba’s bronze background, too). But there the similarity ends. Much as with the confrontation between Jesus and Pilate, here two entirely opposite world-views collide. The one exercises power by bullying and coercion, military might and political clout. The other, relying on the power and authority of a loving Father, chooses to suffer, and dies on a cross. “And having disarmed the powers and authorities, he made a public spectacle of them, triumphing over them by the cross.” Col.2:15. The work is a beautifully contextualised statement on how Jesus challenges that which diminishes our humanity, oppresses us, or distracts us from our true vocation. It is in recognising the truth of Israel’s God and of the one he sent, that we can then see a hope for the world. Without him, insecurity and violence are sure to reign. The carving redeems something of Benin’s art, but in doing so must drastically alter it. Rightly, Jesus is at the centre, and the true power lies – as it should in our lives – in the crucifixion itself. 22 March. Before the Cross IX: Fresh, accessible and slightly subversive. My son is now 14, and thinks he’s much too grown-up for Lego. But I’ve really enjoyed these years of revisiting the world of long six-ers and square flat four-ers, finding myself far more creative now with the pieces than I ever was as a child. 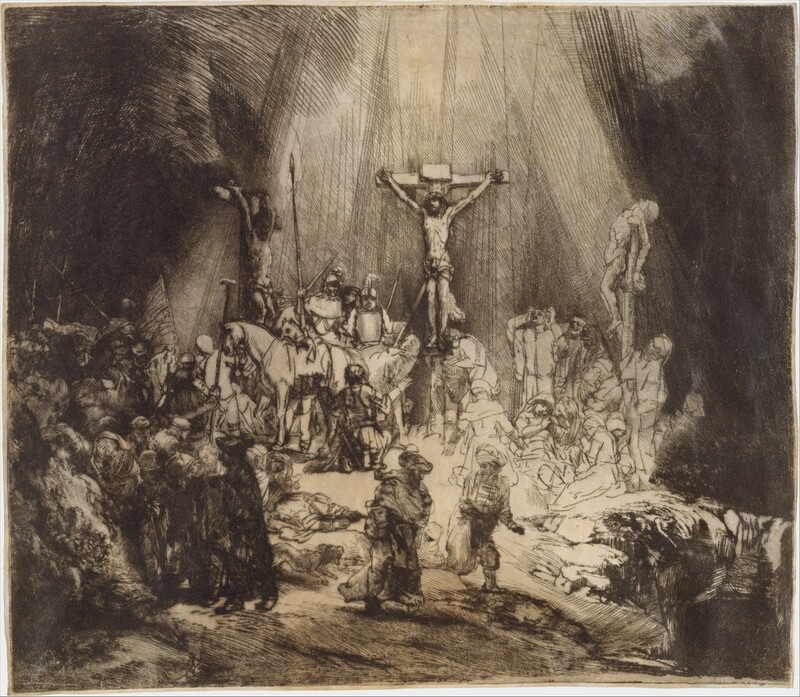 This crucifixion scene is an image designed to appeal to the younger Bible student, of course, as much as to adults. The quotation from Peter’s first epistle connects the death of Jesus with our response in dying to sin and living for righteousness (covenant justice, that is, lest we lapse into moralism). It indicates that its production by EK Johnson was an act of faith and this is important to me, as it is with all Christian art. But shouldn’t a subject as serious as this be treated with more gravitas than Lego can offer? My inner conservative complains that “Lego Jesus” just seems wrong, diminishing his lordship, maybe, or infantilising his mission. My inner iconoclast replies that this Lego scene represents a gentle mocking of religious art – with all its trappings of patronage and power; pride; ill-gotten wealth and elitism – and not of the cross itself. Wasn’t the cross always meant to serve as a massive lance to the boil of religious pomposity? I like this image because I believe that the gospel story should be communicated meaningfully by every possible means. Fresh, accessible and slightly subversive, a Lego representation of Jesus connects and engages with today’s culture in ways that renaissance art and stained glass simply cannot. EK Johnson is clearly keen for us to grasp the solemnity and significance of the event he depicts. “He himself bore our sins in his body on the cross … by his wounds you have been healed” reads the text. The apostle Peter is alluding to Isaiah the prophet, making sense of Christ’s crucifixion through the lens of the Hebrew scriptures and the promised “suffering servant”. If we find the Lego distracting or overly provocative, this text should leave us in no doubt that this was the most profound, powerful and momentous event in all of human history. It was the day the God of Israel worked his salvation for the world; for our lives. Lego might not give us everything we want in a crucifixion scene, but it communicates its historical truth simply and clearly. Every age in religious art has provided its own distortions and distractions, however well-intentioned the artist. We inherit notions of the “sublime” from the Romantics, for example, but it’s a misguided ideal, because it lacks humility. There is certainly humility in Lego. Simple blocks and simple figures remove much of the element of human sophistication. And with that gone, we can begin to grasp – and be overwhelmed by – the love of God demonstrated on a hill in West Asia, two thousand years ago.